Who said boots are not for Mules? Wrong, says Rosa shown here sporting her Epic boots. Rosa belongs to Karen Reeves, a hoof care practitioner. Mules typically have longer feet than horses, as measured from the toe to the heel buttress. In addition, they also have steeper angles and larger heel bulbs. The three biggest challenges that you will face when booting are: 1) sizing the boot, 2) getting the gaiter to fit over the heel bulbs, and 2) determining what you can and cannot adjust to get the boots to fit. Of all the boots we offer, Epics and Bares work the best. We have heard success stories with Old Mac’s (that have inserts), but not to the extent of the other two boots. Below is some general info from EasyCare. Proper fit, of course, is of utmost importance. (We will talk about the gaiter later. Later, gaiter. ) Know how to measure and do it twice right after a fresh trim. Look carefully at the size chart. The upper end of the measurement on the chart is the actual physical dimension of the inside of the boot. For example, a size 1 Epic boot is 4 7/8” wide 5 1/8” long. The boot will be too wide if your length exceeds the width by more than one size. If this is the case for your mule we don't recommend the boots. It is best if the width and length are in the same size range. If, on the length, you are only slightly over the range (1/8” or so) try the smaller size. If you think that mule might be just a tad too large you can remove the back strap which will give you an extra 1/8”. While lots of people ride without the back strap, it sometimes affects hoof stability in the boot. The hoof is more secure with the back strap, which keeps the toe pushed forward. If you remove the strap, you will have to replace it with tapers to keep the gaiter screws from rubbing the hoof wall. With mules you have to be especially careful that the boot doesn’t twist. Read up on how to tighten your boot (available in the brochure or on our website.) If you can turn the boot even the slightest bit with the adjustment as tight as you can get it, the boot is not a good fit. Except for the Old Mac’s G-2’s which have inserts, there isn’t a way to shim a boot that is too wide. It will twist. With some mules, the gaiter that comes with the boot will be too small to fit over the heel bulbs. It is possible to install a larger gaiter, with modifications. Karen Reeves, a hoof care practitioner who boots a lot of mules, gives suggestions on her website here. Keep in mind that if you modify your boot you won’t be able to return it. Boots must be snug! If they go on really easy, they’ll come off really easy! You may have a mule that just won’t fit into our boots. Mules with narrow hooves or very large heel bulbs often cannot wear anything in our current line. At this time we are not planning to make a boot specifically for mules, but there might be something in our 2009 boot line up that will accommodate them better. Keep checking in! For more tips on measuring, click here. Fitting tips are listed separately under each boot. 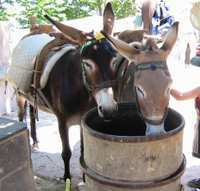 Since there are a lot of mule lovers out there, we have included the article below in our September newsletter on tips for booting your mules. There is also a special page on our website for all you "long ear" lovers. It includes tips, photographs and special links that can answer your questions about hoof care. You can click here to see our new mule page. Mules typically have longer feet than horses, as measured from the toe to the heel buttress. In addition, they also have steeper angles and larger heel bulbs. The three biggest challenges that you will face when booting are; sizing the boot, getting the gaiter to fit over the heel bulbs and determining what you can and cannot adjust. 1. Of all the boots we offer, Bares and Epics work the best. We have heard success stories with Old Mac's (when used with inserts) but not to the extent of the other two boots. 2. Proper fit, of course, is of the utmost importance. (We will talk about the gaiter later. Later Gaiter!) Know how to measure and do it twice right after a fresh trim. 3. Look carefully at the size chart. The upper end of the measurement on the chart is the actual physical dimension of the inside of the boot. For example, a size 1 Epic/Bare boot is 4 7/8" wide and 5 1/8" long. The boot will be too wide if your length exceeds your width by more than one size on the chart. If this is the case with your mule, we do not recommend the boots.